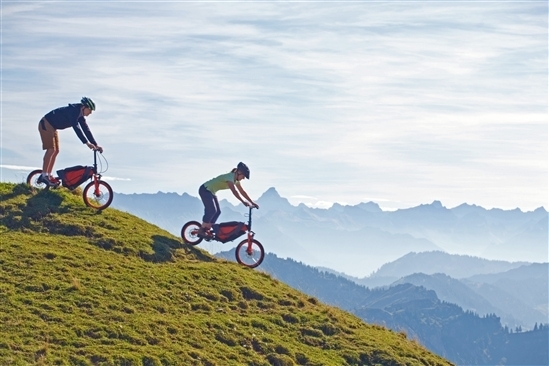 Even the youngest cyclists know that it’s fun to ride downhill. The bummer is that you have to start by getting to the top of a hill in order to enjoy it. Sometimes that’s a long slog in the saddle. Sometimes it’s a ride in a helicopter. And sometimes, it’s a Bergmönch. This is a German bicycle/backpack, designed for those who want to hike uphill and ride down at the end. I don’t see any distributors but you can order one directly from the company for $1500. For that price, it seems as though they ought to include a place to sit. Bergmönch. For those who like to ride, and don’t care to sit. This entry was posted in It's a floor wax *and* a dessert topping on March 30, 2015 by stern. Now if somehow I could get a bike that only let me ride uphill, I could strap Bergmönch to my back for the uphill climb and the anti-Bergmönch to my back for the decent. Just think how wonderful that would be!